Washington did not swerve from what was to him a fundamental principle --"whatever efforts are made by the Land Armies, the Navy must have the casting vote in the present contest." He sought every opportunity to urge a true naval superiority. The French finally did send a strong force under Admiral Francois Joseph Paul, Comte de Grasse. This force, composed of 28 ships-of-the-line and 3000 troops had arrived in the Chesapeake Bay at the end of August 1781. What followed, on September 5, 1781, off the Virgina Capes, was a sea skirmish that effectively sealed the victory of the Americans in their revolution. To set the picture. Lord Cornwallis and his forces had left the Carolinas (after battles at Cowpens and Guilford Courthouse) and invaded Virginia. American forces and forces led by Wayne and Lafayette were in pursuit. Cornwallis headed for the peninsula on which Yorktown lay. But, unknown to Cornwallis, a major French fleet was underway towards North America. Where and when the French naval force would appear off the coast was de Grasse's decision to make. However, in spite of Washington's known predilection for New York, Rochambeau helped shape the Admiral's thinking when he wrote: "There are two points at which to act offensively against the enemy: the Chesapeake and New York. The southeast winds and the distress of Virginia will probably cause you to prefer the Chesapeake Bay, and it is there where we think you can render the greatest service; besides, it would take you only two days to come to New York." The swift and elusive frigate Concorde, acting as a courier, reached Newport on August 12 with dispatches making known de Grasse's intention to sail from Cape Haitien on August 3 (actually it was not until the 5th that he got underway) for the Chesapeake. De Grasse stressed that time was of the essence since a commitment to act with the Spanish in the West Indies precluded his remaining in American waters after October 15. This was it. De Grasse was bringing a naval superiority to the Chesapeake, a "circumstance" provided for at Wethersfield, and which now dictated that the New York campaign be abandoned for the "other quarter." The French-American army broke camp and hastily started southward. Meanwhile, unaware of the grand design taking shape against them, what moves were the British making? Cornwallis invaded Virginia from North Carolina in May 1781, and moved about the state while Lafayette and Wayne's small force snapped at his heels. By late August Cornwallis was encamped at Yorktown and fortifying that place as well as Gloucester on the opposire bank of the York River. Lest we write off the English lord as a complete fool for putting his army in what proved to be an impossible position, let us record several salient facts. In the first place Cornwallis had been ordered by Sir Henry Clinton, his superior in New York, to occupy a naval station site in the Old Point Comfort--Yorktown area. Further, he was confident that Lafayette did not have the strength to contain him if he desired to move out, and he had no way of divining that Washington and Rochambeau were converging on him from the north. And lastly, but most significantly, he never for one moment entertained the thought that the Royal Navy would be forced to yield and abandon him. In short, there seemed to be nothing in the Yorktown situation which spelled "trap" to Cornwallis. As soon as reliable intelligence established de Grasse's impending move to the American coast, Admiral Sir George Rodney, senior British naval officer on the West Indian station, detached a 14 ship squadron under Rear Admiral Samuel Hood as a reinforcement for New York. At this juncture, Rodney made a fatal miscalculation in estimating the size of the fleet de Grasse would bring to America. Consequently, he did not allow Hood a sufficient number of ships. Admiral Hood departed Antigua in the West Indies on August 10, five days after de Grasse had sailed from Haiti. Both fleets took more or less parallel courses but did not fall in with each other on the northward passage. The coppered bottoms of the British ships made them faster sailers than the French. Hood reached the Capes of the Chesapeake August 25, took a look inside, found nothing amiss, and continued on to New York where the squadron passed under the command of the senior flag officer, Rear Admiral of the Red Sir Thomas Graves. This then was the situation on August 30, 1781 when de Grasse's 28 ships entered Chesapeake Bay and came to anchor in Lynnhaven Roads. Cornwallis was digging in at Yorktown, and the British fleet numbering 19 line-of-battle ships was at New York. Washington and Rochambeau's combined armies had reached Philadelphia, while Lafayette waited in position to contest any attempt by Cornwallis to retreat into North Carolina. A French squadron, comprising eight of-the-line under Admiral de Barras, was at sea after clearing Newport for the Chesapeake on August 25 with heavy siege guns on board. De Barras' direction made it clear to the British command that the major Allied effort was being aimed against Cornwallis. Admiral Graves' fleet weighed from Sandy Hook on the first of September hoping to snare de Barras enroute and still reach the Chesapeake before de Grasse. The French squadron out of Newport was not found, and the British held their southerly heading without incident to the mouth of the Chesapeake. 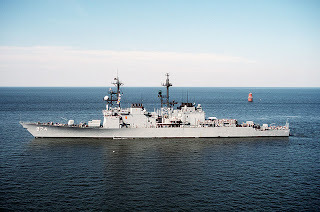 On Wednesday morning September 5, the scout frigate Solebay signalled the presence of a fleet inside the Bay at anchor from Cape Henry to the Middle Ground Shoal. Standing on the quarterdeck of his 98-gun flagship London , all Admiral Graves had to do was rapidly scan a long glass over the forest of tall masts to recognize at once that this was not de Barras, but de Grasse with the main French body. The supreme moment was at hand. If the Frenchman elected to come out and fight, as most assuredly he would, Graves held the tactical whip hand oft discussed over wardroom pipe and glass but seldom realized. The English ships were in open water bearing down before the wind. On the other hand, de Grasse's lumbering fleet had to gather up crewmen scattered around the harbor on various duties, take in their boats, prepare to get underway, and, when ready, beat out through a narrow channel a few ships at a time. Graves could fall on the disordered French van in force as it straggled out; that is, "gang-up" on the first ships to clear the Bay. In this manner, de Grasse's superiority in ship numbers and weight of metal would have been nullified, and to use the language of military science, the French fleet might well have been destroyed "in detail," i.e. piece by piece. 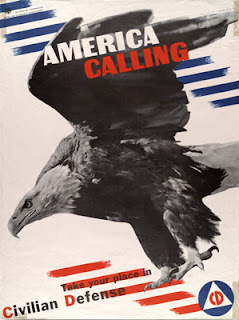 A Rodney or a Nelson would not have muffed such a golden opening to land the knockout blow, but fortunate it was for American independence that Thomas Graves was neither. 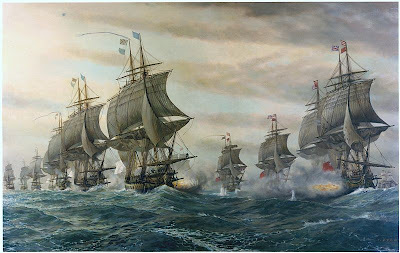 His tactical precepts were those of the Royal Navy's venerable and encrusted "Fighting Instructions," based on the classic concept of two opposing lines of battle with ship against ship slugging it out broadside to broadside in the manner of jousting knights. And this is how Graves would fight de Grasse. From the London went the Admiral's signal to form the "line of battle ahead," distance between ships one cable length (608 feet in the British Navy). About noon the French fleet began standing out on the ebb tide. By two o'clock, the van and center, 16 ships including the huge 104-gun Ville de Paris in which de Grasse flew his flag, were well outside the Bay on an easterly course. Graves, still holding the weather gage, ordered his ships to wear, thus bringing the English line parallel to the French and on the same heading. 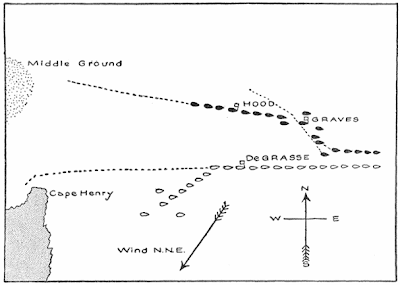 De Grasse's lead ships were then opposite the English center, and Graves did not break the signal "bear down and engage the enemy" until the French line had advanced to a position where van opposed van. The French ships were all out and formed up at four o'clock when the cannonade opened on both sides. Graves hoisted conflicting signals which utterly baffled the English division commanders and captains as to whether it was the Admiral's intention to maintain the strict line ahead or release ships to seek targets of opportunity. Therefore, the action never became general. Only the van ships were closely engaged, the centers partially at long range, and the rears not at all. In de Grasse's mind there were two things to accomplish: first, to hold the bay, and secondly, to keep the British occupied far enough at sea to allow the Newport squadron to slip in. 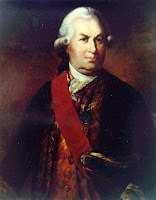 Of course he could have made sure of both objects and a great deal more by defeating the British fleet in a decisive action, but that was not the French naval doctrine. The entrance to the Chesapeake is ten miles wide but the main channel lies between the southern promontory and a shoal called the Middle Ground three miles north of it. The British stood for the channel during the morning and the French, taking advantage of the ebbing tide at noon, cleared the bay, forming line of battle as they went. As they had to make several tacks to clear Cape Henry, the ships issued in straggling order, offering an opportunity for attack which Graves did not appreciate. Instead he went about, heading east an a course parallel to that of de Grasse, and holding the windward position. When the two lines were nearly opposite each other the British admiral ware down to attack. Graves's method followed the orthodox tradition exactly, and with the unvarying result. As the attacking fleet bore down in line ahead at an angle, the van of course came into action first, unsupported for some time by the rest. As the signal for close action was repeated, this angle was made sharper, and in attempting to close up the line several ships got bunched in such a way as to mask their fire. Meanwhile the rear, the seven ships under Hood, still trailing along in line ahead, never got into the action at all. Graves had signaled for "close action," but Hood chose to believe that the order for line ahead still held until the signal was repeated, whereupon he bore down. As the French turned away at the same time, to keep their distance, Hood contributed nothing to the fighting of the day. At sunset the battle ended. The British had lost 90 killed and 246 wounded; the French, a total of 200. Several of the British ships were badly damaged, one of which was in a sinking condition and had to be burned. The two fleets continued on an easterly course about three miles apart, and for five days more the two maneuvered without fighting. Graves was too much injured by the first day's encounter to attack again and de Grasse was content to let him alone. 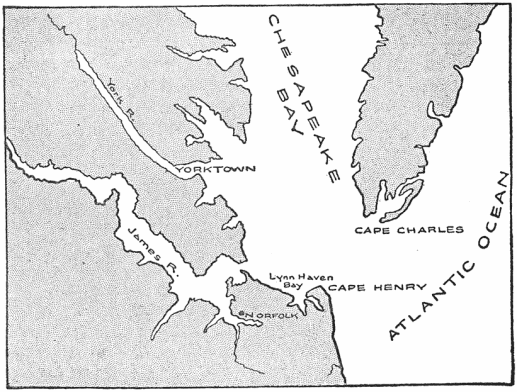 Graves still had an opportunity to cut back and enter the bay, taking a position from which it would have been hard to dislodge him and effecting the main object of the expedition by holding the mouth of the Chesapeake. But this apparently did not occur to him. De Grasse, who had imperiled Washington's campaign by cruising so far from the entrance, finally returned on the 11th, and found that the Newport squadron had arrived safely the day before. When Graves saw that the French fleet was now increased to 36 line-of-battle ships, he gave up hope of winning the bay and returned to New York, leaving Cornwallis to his fate. A little over a month later, October 19, the latter surrendered, and with his sword passed the last hope of subduing the American revolution. This battle of the Capes, or Lynnhaven, has never until recent times been given its true historical perspective, largely because in itself it was a rather tame affair. But as the historian Reich observes, "battles, like men, are important not for their dramatic splendor but for their efficiency and consequences.... The battle off Cape Henry had ultimate effects infinitely more important than Waterloo." 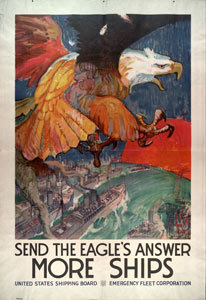 Certainly there never was a more striking example of the "influence of sea power" on a campaign. Just at the crisis of the American Revolution the French navy, by denying to the British their communications by sea, struck the decisive blow of the war. As noted, the French fleet trapped Cornwallis in a vise against the American forces moving down the peninsula. On October 19, 1781, Cornwallis surrendered. The American Revolution was, essentially, won. In his honor, the U.S. Navy has named three ships after Admiral DeGrasse, the last being a Spruance-class destroyer since decommissioned and sunk as a target. Love these historical pieces you've done. Bravo Zulu. You may be further interested in a small book called "George Washington's Secret Navy" by James Nelson. It describes Washington's attempts to stymie British resupply of the forces in Boston, under the radar of Congress and using only a few small schooners and such.